You might have caught her on TLC network’s “Sunday Brunch”, providing tips on hosting, well yes, a brunch, but with more panache, style and originality than you are used to. Or you might have hired her to do one of your events in town. Or, you might have actually just attended one of the numerous functions Jodi Moraru, the founder and president of the event planning firm EVOKE has planned and produced in the area for over two decades. Even if you didn’t know it, she and her tireless team were behind the scenes meticulously fine tuning every detail to ensure thatÂ youÂ were delighted. It’s a darn hard thing to do in this town, where you could pick from 10-20 gatherings to attend on any given night or day. Seriously, I know. I’ve counted. We were pleased to have Jodi’s undivided attention so we could learn more about her as well as her thoughts on event venues, her inspirations, and even her personal style. 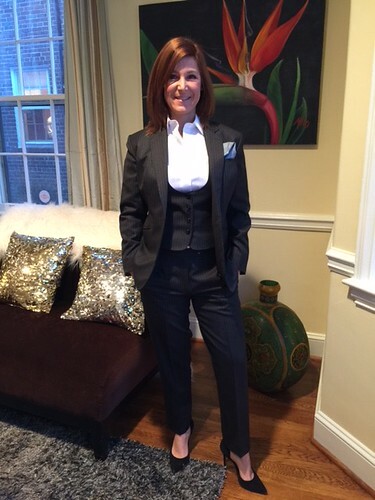 Hat tip to our friend Sanjay Daswani at The Tailored Man, whom Jodi includes in her cool wardrobe, for the introduction. I am a firm believer in taking care of myself mentally, physically and spiritually. Pamelaâ€™s Punch: First congratulations on your over two decades of success in one of the hardest markets for event planners – and by that I mean competitive and engaging with some VIP, high-level/maintenance and challenging clients- with iffy non-dependable weather to boot! I read in an article that you never Google your clients before you meet them. Tell us the reasoning behind that strategy, especially during an era where ALL we do is Google anything and everyone. Jodi Moraru: So true!Â A lot of people disagree with me as they feel it gives them the leg up on understanding who the client is.Â My feeling is that knowingÂ a person comes from meeting in person, talking and sharing.Â I want to know who they are and what is important to them as they are planning their event.Â I worry that reading about people on Google creates a bias, and to me, everyone is important and equal. Itâ€™s a daily effort but itâ€™s important to be active on social media, to share information, and to stay connected.Â Itâ€™s definitely time consuming but weâ€™ve made it part of our daily rhythm. JM: I am proud to say that I am a native Washingtonian.Â Actually I grew up in Vienna, Virginia (but close enough) and my dad is a native Washingtonian.Â I went to Old Dominion University and studied in partying. LOL!Â I have business degree and knew early on that I loved planning events.Â Back then it wasnâ€™t the huge industry it is now but I was very lucky in landing a job after college with Rita Bloom, the matriarch of event planning, at her company Creative Parties. PP: Your business is 24/7. What do you do to stay fit and yet calm for your clients and your staff? JM: I am a firm believer in taking care of myself mentally, physically and spiritually. As I say to my family â€œIf Mama ainâ€™t happy, no oneâ€™s happyâ€.Â I work out 3-4 days per week, I meditate almost daily, I sleep about 8 hours a night, eat very clean and healthy (most of the time), and wake up every morning feeling very grateful. My style of dress truly depends on my mood. JM: We utilize social media in a variety of ways beginning with our website (which we are about to refresh), Instagram, Facebook, Twitter, and a weekly blog.Â Itâ€™s a daily effort but itâ€™s important to be active on social media, to share information, and to stay connected.Â Itâ€™s definitely time consuming but weâ€™ve made it part of our daily rhythm.Â What I find most interesting is that you never know what will truly resonate with people when you post so we are constantly â€œplayingâ€ with it. JM: My style of dress truly depends on my mood. Given that each day is different from the next â€“ some are office days, some days, I am in meetingsâ€¦will set my vibe.Â I love jeans and boots for the casual days with a great top or sweater and I would say my vibe has tended to be a more Bohemian/rocker style of dress.Â Casual and chic with a bit of flair. I love cuffs and big earrings.Â Lately, however, since my foray into the world of custom tailored suits with Sanjay Daswani from The Tailored Man, I find that I am loving the clean and chic look of a more man cut pant with a great button down, and awesome â€œguy styleâ€ flat shoes.Â I just bought a fabulous pair of French Connection shoes that look great with black pants, jeans or even a tuxedo. I have loved watching the Washington, D.C. style evolve (as a native Washingtonian myself) and I find that my clients tend to veer toward classic with a twist, allowing them to incorporate their own personal style which alsoÂ plays into their senses when designing an event. I like to be able to shift easily from day to evening as I am usually on the run and donâ€™t have a lot of time to fuss so when I buy pieces itâ€™s with the intention of mixing and matching and moving from day to night, season to season.Â I am also a huge lover of vintage so some of my evening wear is vintage.Â It looks and feels glamorous and yes, I do love a good high heel.Â Since my event days are long, I start out in pants and an EVOKE shirt (branding you know) and very often change into a tuxedo for the evening.Â Iâ€™ve been wearing one for years and itâ€™s comfortable, looks chic and I can put my cell phone in my pocket. Â After hours of being on my feet, I am less inclined to wear high heels for so many hours so the tux allows me to change into flat shoes after a while. JM: I have loved watching the Washington, D.C. style evolve (as a native Washingtonian myself) and I find that my clients tend to veer toward classic with a twist, allowing them to incorporate their own personal style which alsoÂ plays into their senses when designing an event. At EVOKE itâ€™s important to us to learn the nuancesÂ of our clients, to just create unique details and exceptional experiences that leave there mark on the event. There are so many venues, of all sizes and designs and weâ€™ve got some incredible hotels too in this city with top notch culinary and service teams. Â Itâ€™s a great city for events. PP: You have mentioned the importance of Life-Work Balance, something everyone wishes she could get a handle on. What steps to do you take to ensure you are following this mission? In other words, help! We need advice! JM: You donâ€™t need to be a maniac about it and do everything at once. I met a lovely woman the other day and we were talking about this very thing. She was exhausted, overwhelmed and feeling out of touch with herself. I said â€œWhat one nice thing could you do for yourself todayâ€ and without hesitation she said â€œtake a bubble bathâ€. I touched base with her the very next day to find out if she had taken her bath and she had.Â It really helped to center her.Â It can be as simple as getting up and walking around the block for 10 minutes to catch a breath of fresh air.Â Breathing is most important and even doing a 5 minute meditation will help to put everything back in balance and perspective. JM: I would say without hesitation my family. My mom (who passed away 13 years ago) was warm and loving. She never met a stranger – she embraced everyone like an old friend.Â She truly touched the people she met.Â The last few years of her life, she was not well, yet she woke up every day, showered, did her hair, makeup, dressed beautifully, even if she never left the house.Â I think that says a lot and helped her to feel the best she could. My husband Eldad not only has incredible style but an amazing outlook on life and is probably one of the most centered and Â balanced people I know.Â His ability to find the time to take care of himself mentally, spiritually, emotionally, physically also inspires me and we work our schedules so we can both find the time. My kids are amazing and one of the best lessons I learned was from my 15 year old son Eli who taught me a thing about priorities.Â He said â€œMom, not everything can be a priority, so you have to pick and choose and work accordinglyâ€.Â He taught me this when he was 13.Â Itâ€™s how he manages his life and I do much better about it now as well. And then thereâ€™s Talia, my 10 year old with a joie de vivre so huge it could swallow a room.Â Talk about style â€“ sheâ€™s got it! You donâ€™t need to be a maniac about it and do everything at once…Breathing is most important and even doing a 5 minute meditation will help to put everything back in balance and perspective. JM: There are so many awesome spaces and more popping up all the time.Â I love the dramatic impact of the Mellon Auditorium, the NY vibe of Longview Gallery, the raw and untouched feel of Photogroup (hidden gem folks! ), the ability to work with the Union Market vendors in the Dock 5 space and Â the beauty of the Anderson House. There are so many venues, of all sizes and designs and weâ€™ve got some incredible hotels too in this city with top notch culinary and service teams. Â Itâ€™s a great city for events. For Corporate events itâ€™s fun to work in the Smithsonianâ€™s and I do love the Portrait Gallery.Â United States Institute of Peace Building is on my list too (very cool space).Â I have to say I do miss the Halcyon House. Prev Introducing The Punch Power Circle – Women of Distinction in D.C.